Insect eggs hatch into maggots, or the larval stage, very quickly. Fly maggots usually hatch less than a day after the female lays eggs. Flies lay eggs in batches of 150 or more, producing several such batches in just a couple of days. When it's warm outside, maggots can emerge from eggs laid only eight to 20 hours earlier. Resembling tiny white worms, maggots eat from the site where they emerged for up to five days. Since flies often lay eggs inside garbage and recycling cans and other potential food sources, keep these receptacles covered and as clean as possible. Flies also lay eggs inside the wounds of animals -- both wild and domestic -- dead creatures and manure. After three to five days of feeding, maggots squirm up to 50 feet away from the hatching site to a dry area and begin to pupate. How long they remain in the pupal stage depends on the temperature. In warm weather, adult flies emerge from the pupal in six days or less, but cold temperatures can delay maturation for two to four weeks. 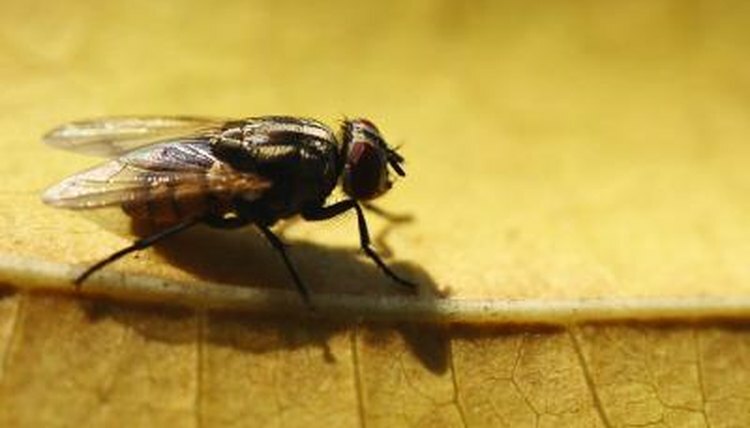 What Are Houseflies Attracted To?